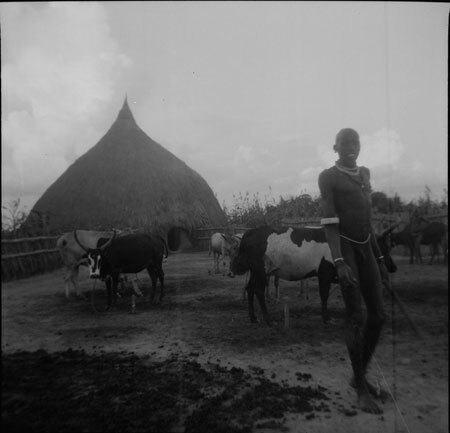 A Nuer man standing in the cattle pen of his homestead, the cattle byre (luak) visible beyond. Allen notes that this married man was the most important individual of this settlement near Ler. Allen visited Ler for a fortnight after meeting the missionary there, Canon Ewell, on the steamer from Juba. List with captions, essay, correspondence in Related Documents File. Morton, Chris. "Nuer man in homestead" Southern Sudan Project (in development). 03 Jan. 2006. Pitt Rivers Museum. <http://southernsudan.prm.ox.ac.uk/details/1998.436.15/>.